The “Bird Dog” is an indispensible part of many a game hunter’s repertoire. There are various types of Bird Dogs, including retrievers and pointeres, but perhaps the most interesting one (and certainly the most relevant to the topic at hand) is the Flusher. A flusher (aka Flushing Dog) first finds the game and then drives it from its hiding place, flushing the game into the open where the hunter finishes it off. The goal of the pass rush is to affect the QB and disrupt the play. Hitting the QB, disrupting his eyelines, moving his set point and forcing him to adjust his throwing position. In the best case, the pass rushers will sack him and put an end to the play entirely. Nearly every QB is going to be at his best when he has a nice, clean pocket. Even when a violent outside rush is coming, if the pocket is clean, the QB can keep his eyes downfield, step up, and make a strong throw. The 2016 Oakland Raiders pass rush has some very good outside rush. Both Khalil Mack and Bruce Irvin have been able to attack and defeat blockers outside, but for nearly this entire season, the interior pass rush has been lacking. Jihad Ward, Dan Williams, Justin Ellis, Denico Autry, Stacy McGee, Darius Latham have all had a chance, but rarely have they been able to consistently compress the pocket from the inside or to beat the blockers and come clean. In other words, the Raiders’ defense has two very good Hunters, but the team has no Flushers. This becomes increasingly important against teams that feature the Quick Pass offense. Flashbacks to Drew Brees in Week 1, when he steps back and is able to get the ball out of his hands in about 2.5 seconds. All that Khalil and Bruce are doing is running 2.5 second wind sprints and never getting close. Quick passing offenses feature short drops (3 or 5 steps) and ideally the QB is able make his drop, take a hitch step forward and deliver the ball. If the pass rush is able to push the middle of the pocket backwards into the QB, it begins to change everything. The QB is no longer comfortable; he no longer has clean space and may not feel able to step up; his view downfield can get obscured and his throwing lanes can get dirty. Even better, if the interior pass rush is able to “flash color” (meaning for the opposing color jersey is able to escape from a blocker and become visible to the QB) it can disrupt the QB. If an interior pass rusher can come free, then it forces the QB to either adjust in the pocket or to scramble outright. So what do you do if you do not have that interior pass rush and are facing a Philip Rivers-led quick passing offense? One solution is to have Khalil Mack become an interior disruptor. Have Khalil run more counter, inside rushes rather than those outside ones. Instead of attacking Rivers and trying to sack him, attack the area of pocket about 2-3 yards in front of where his launch point is. Put a mess right in front of Rivers and force him to adjust. When a QB moves like this, it makes things difficult for the blockers; they have their backs turned to the QB and their blocking sets and their technique is designed to protect the intended pocket. When the QB moves, the blockers may no longer be protecting the correct area of the field. Sometimes the blockers actually HELP the pass rusher get to the QB’s new position. Since Rivers is a traditional pocket QB and not a mobile one, losing contain has little consequence (compared to someone like Alex Smith). 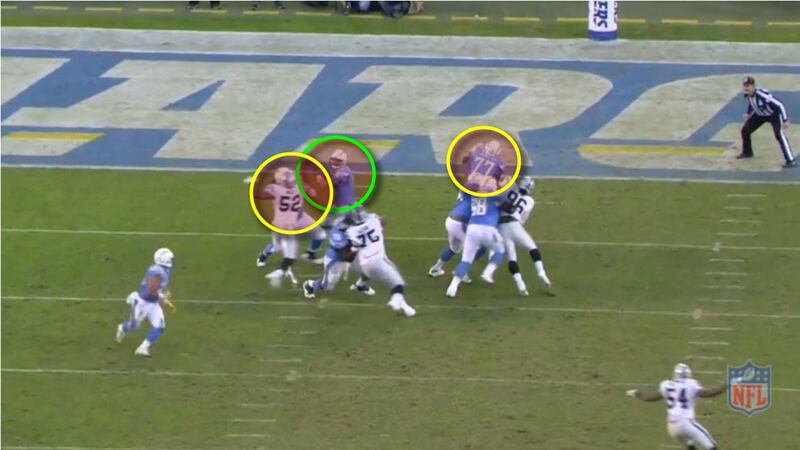 So Mack can sell out for these types of disruptions and set the stage for someone else to finish off the play. Here’s a look at a few plays that show this in action. The Green circle shows where Rivers’ back foot will set, about the 13 yard line. Mack jabs outside and then attacks inside. Curiously, Denico Autry also loops into that same game causing a bit of a pileup. Notice that Mack (and Autry) rush and disrupt the pocket at about the 16-17 yardline, right in front of where Rivers wants to set up. Bruce Irvin’s outside rush is well past Rivers’ set point. The RT does a good job of setting inside and riding Bruce around past where the expected set point is. Mack and Autry crash inside. 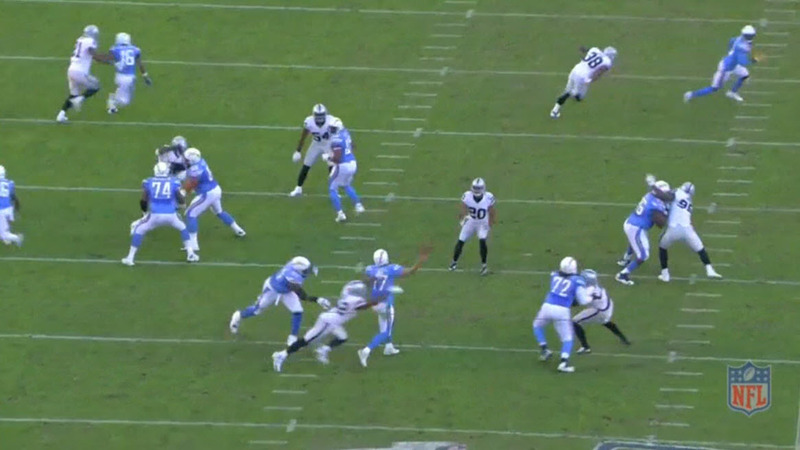 Mack coming inside leaves the left side completely open and the disruption forces Rivers to move that way. Bruce loops up and outside and here we see that without the interior pressure, Bruce probably just goes right on by. And here we see how Rivers will escape. Rivers has a 5 yard head start but Bruce will close on him for the sack. 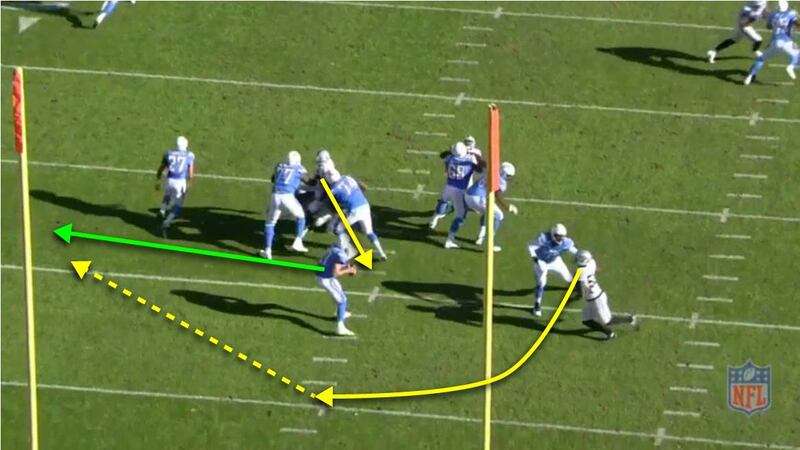 Bruce takes an outside rush and as in Play #1, his original path would take him up and around Rivers’ initial set. Mack’s fake outside rush gets the RB chip to avoid him and thus leaves him with a clean 1-on-1. Latham’s inside rush opens up the inside pass rush lane. 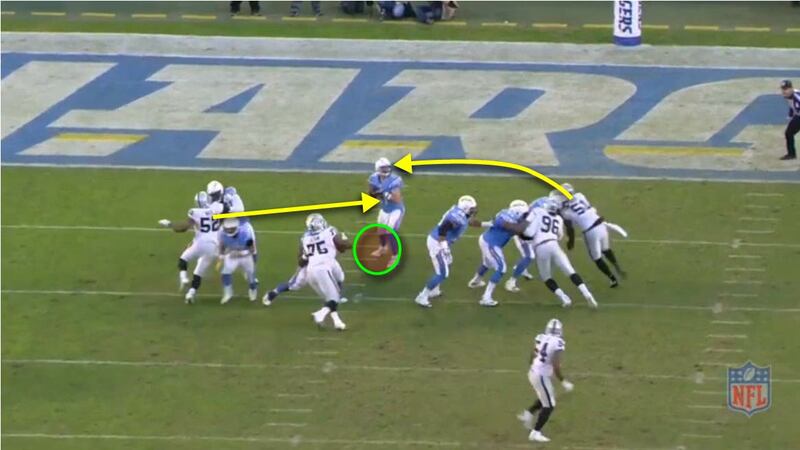 And here we see how Mack’s rush affects Rivers into running right into Bruce’s sights. 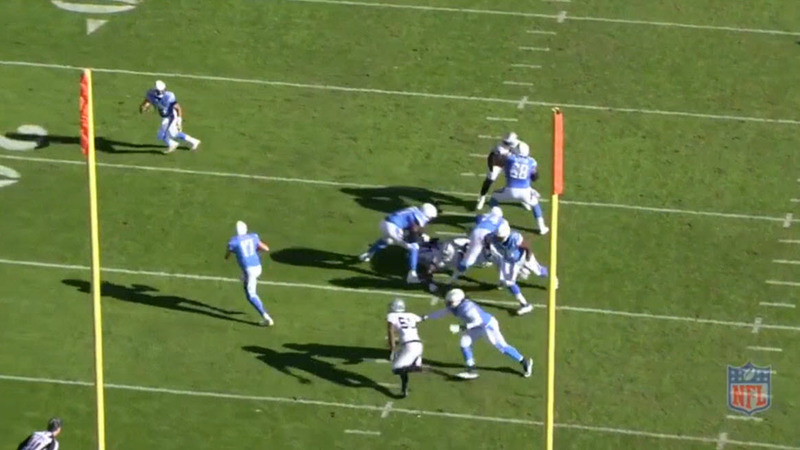 Mack crashes hard right in front of Rivers and gets into his eyeline and his passing lane. Rivers drops his eyes to look at him and Mack’s arm in the air threatens to swat a ball if it’s thrown. On the outside, Irvin is actually well-handled and the LT has set him to loop out and around Rivers… if the pocket were clean. 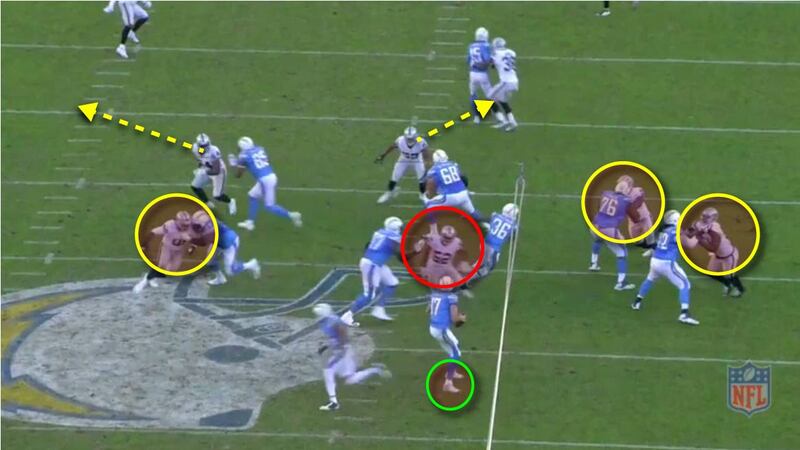 Rivers scrambles and Bruce easily takes him down. This is very similar to Play #2. 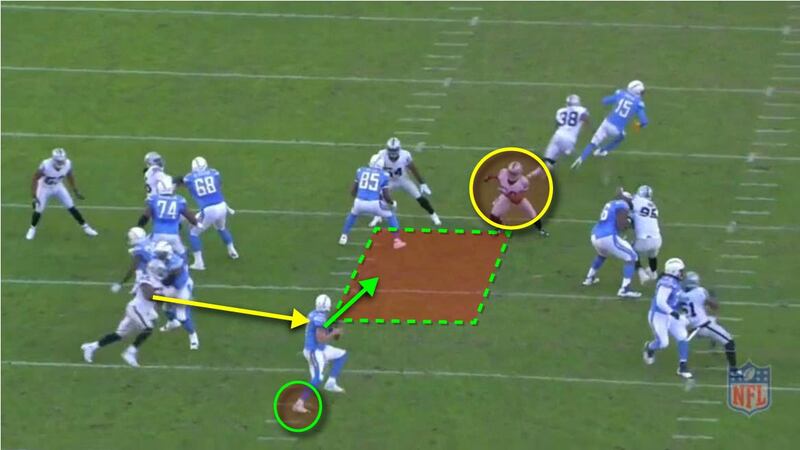 This time Mack makes less of a disruption and Rivers is able to adjust and re-set himself. 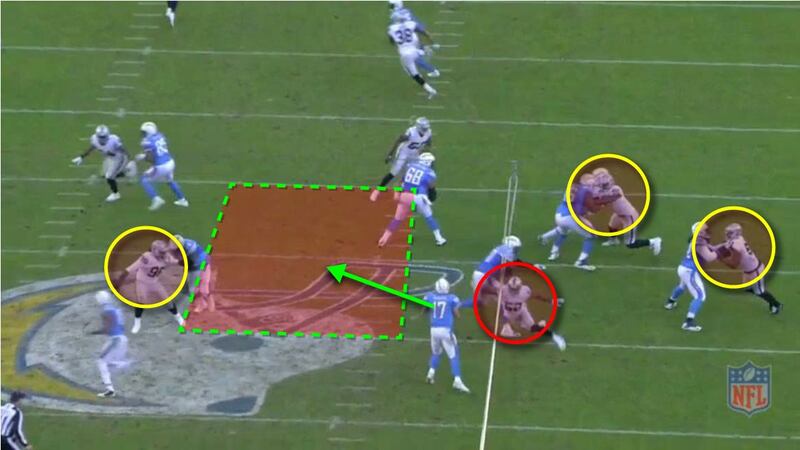 But it still puts him right in the line of fire for Bruce Irvin and Rivers can’t make a clean, strong throw. Now that we’ve seen some of the effective uses of Mack disrupting the pocket from the inside, here are a couple of plays that show what happens when the pass rush doesn’t quite work in sync like that. 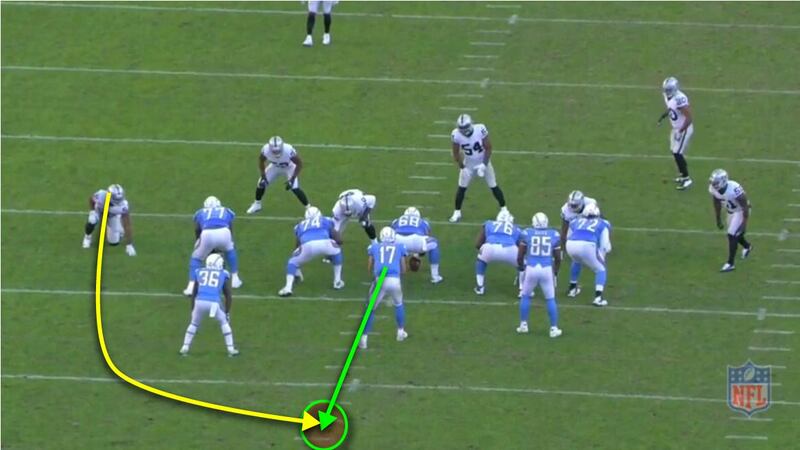 This is Rivers’ dropback from Under Center. Mack will do as before and take a jab outside and then counter inside to attack the interior pocket to disrupt Rivers. That’s Denico Autry on the left of the image. To the right side, Jihad Ward and Bruce Irvin are stonewalled. Perry Riley dropping in coverage. Malcolm Smith in the middle fakes a blitz and draws the Center. When Malcolm then drops back, the Center is just reaching for air and blocking no one. That’s 3 1-on-1 matchups aside from Mack and the Chargers win each one. 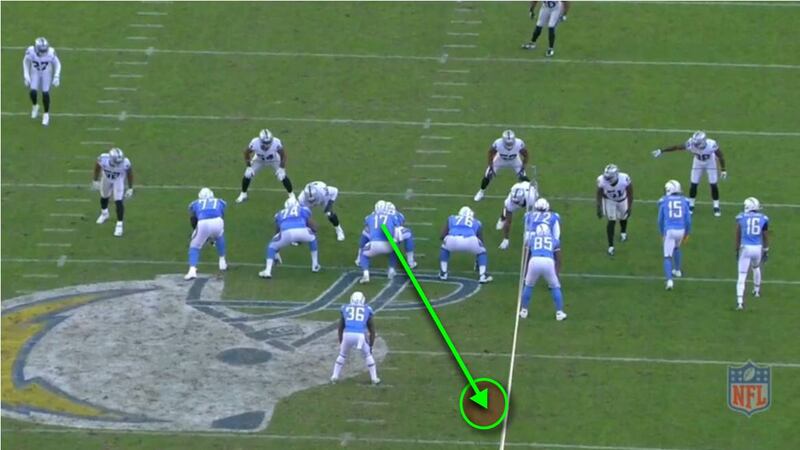 Mack “flashes color” as he comes up the middle at Rivers. After re-setting, Rivers has no one near him; he’s able to easily set, scan, and throw. Rivers is flushed, but there’s no chase rusher to take him down. Mack wins his 1-on-1 with the LT with some beautiful hand-fighting (more on that later) and is able to flatten his rush to hit right on Rivers’ set point. From this still, looks like Mack’s 9th straight game with a sack coming up. 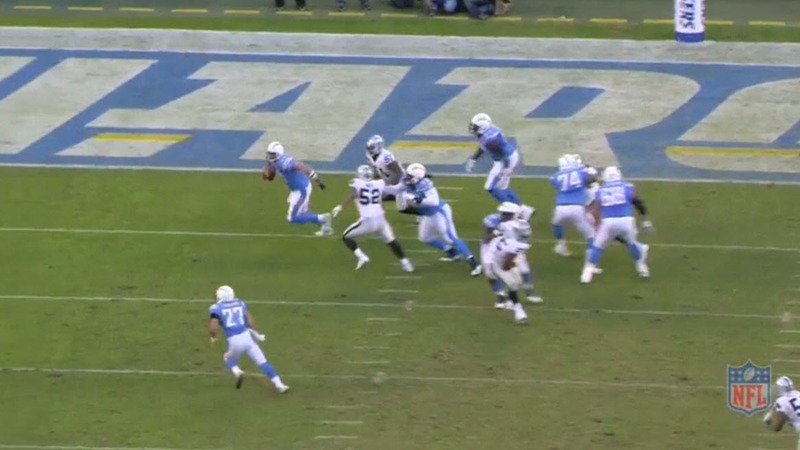 Rivers has a nice and relatively clean pocket in front of him. 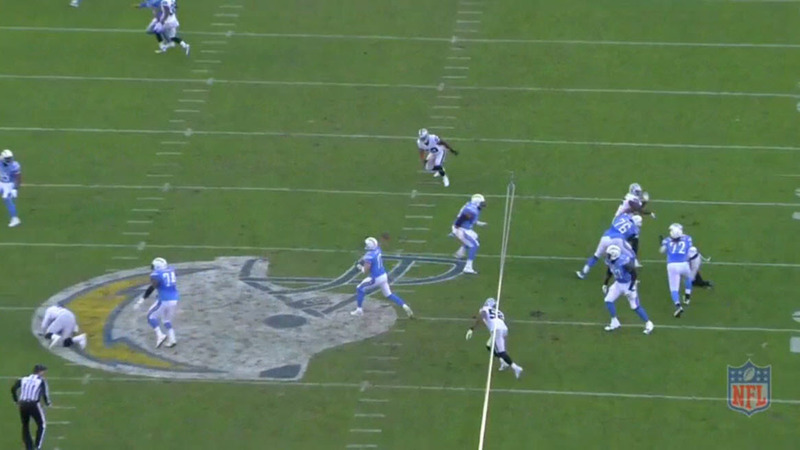 When he feels Mack closing, Rivers will calmly step up away from the danger and make the downfield throw. Nate Allen recognizes Rivers stepping up and is rushing up the middle, but he’s way too late to make an impact on the play (more on that later). A lesser QB may have been sacked here, but Rivers is able to move just enough and get the ball out quickly enough to turn a potential sack into a big gain (you can see that TJ Carrie was beaten and slips on the play). Nate Allen comes on a blitz, but then suddenly pulls up. 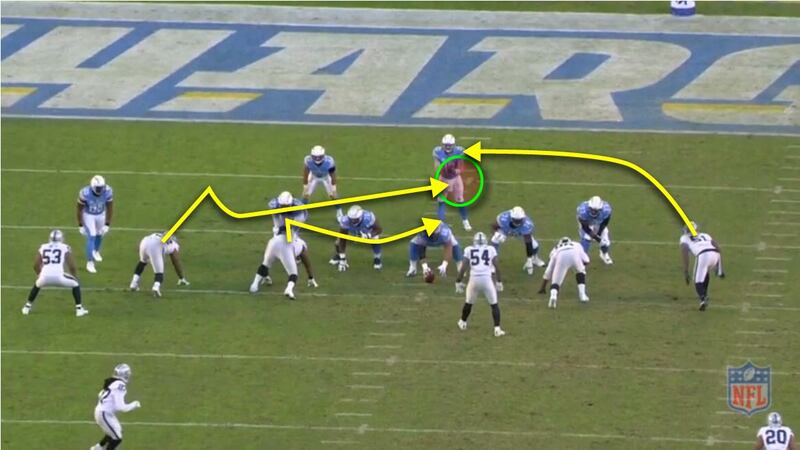 #85 Antonio Gates is blocking, but gives an impression that he may be running a route. Allen’s first assignment is to help Perry Riley and then to rush. 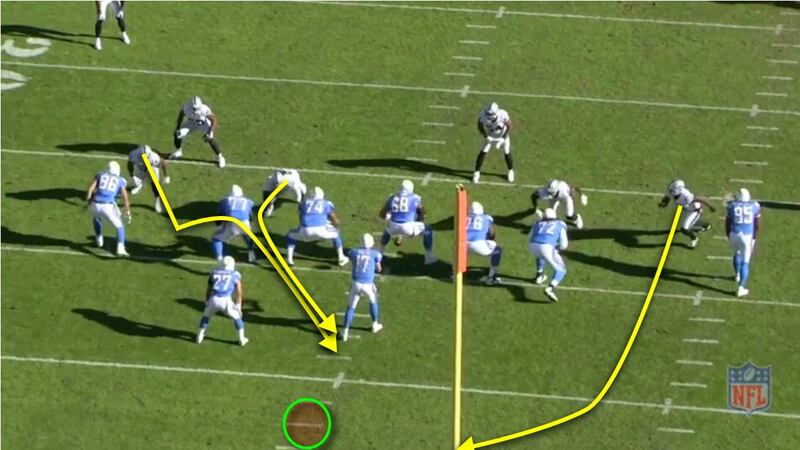 When Allen recognizes that Gates is in protection, Allen is able to re-start his rush, but by then it’s too late. In hindsight, if Allen continues to come, he may have been able to affect Rivers’ throw or his physical presence up the middle may have prevented Rivers from stepping up and allowed Mack to have the sack. Again, we see that Ken Norton Jr recognizes the need to affect the interior pocket and that he cannot rely on the D-Line to do so. Here, he calls for the Allen blitz and it’s a great call, but just doesn’t quite get the job done. It is these little details that make big differences in a play from a 10 yard sack to a 20+ yard gain. Mack’s handfighting in 2016 deserves a full post on its own; he’s been doing a number of very interesting things and he’s getting very good at it so quickly. Here’s yet another play where he’s attacking the blockers hand, wrist, or arm (in this case it is the wrist) and get free. In a way, we should credit all non-called holds for inciting Mack to work on his handfighting. These techniques prevent the linemen from being able to hold him. Very rarely does a team get to field an absolutely perfect group of defensive players and so the defensive gameplan has to adjust for the talents of the players that are taking the field. The very clear weakness of this group is the interior pass rush and so an interesting adjustment against San Diego’s quick pass attack was to try to disrupt Rivers by having Mack (and sometimes other players) attack the interior pocket, flushing him and allowing for opportunities for other players. Bruce Irvin was the most notable beneficiary and came thru with 2 sacks and multiple pressures for one of his most obviously excellent games of the season. 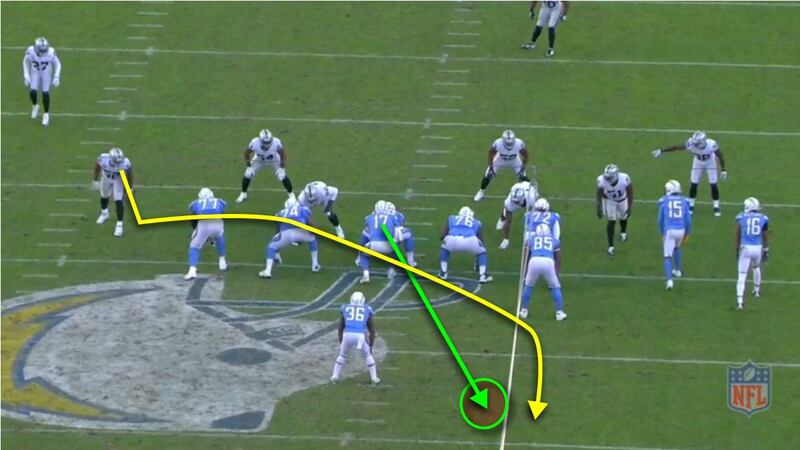 In these plays, Mack took on the role as the Flusher and let Bruce be the Hunter. What makes this particularly noteworthy is that (a) it was an effective adjustment from Ken Norton Jr and (b) this interior pass rush is precisely what Mario Edwards Jr’s return promises to improve. Here Brock Osweiler feels Khalil Mack to the outside and wants to step up in the pocket. Mario Edwards is crushing the pocket from the inside. Osweiler has nowhere to step up into and ends up turning right into Mack for the sack. The Interior Pocket is crucial not just to padding Mack’s stats (thought that’s certanly nice), but for making QBs uncomfortable. Just the bodies and the physical presence of a “dirty” middle of the pocket can make QBs a little bit nervous even if no one actually gets a hit. Last year, Malik Jackson on Denver’s DL was able to affect entire games by providing interior presence and getting into passing lanes to knock down passes. He only had 5.5 sacks last year, but 7 batted passes and was a force that really helped the outside rush of Von Miller, DeMarcus Ware, Shane Ray, and Shaq Barrett. 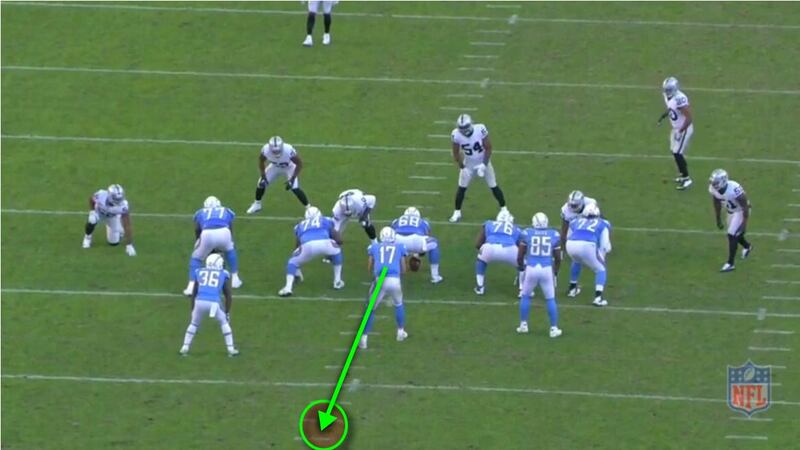 It’s exciting to think of Mario Edwards working his way back into game shape and being such a disruptor, but in the meantime, we also know that Ken Norton is starting to work some alternatives and this defense is able to now start attacking that interior pocket in a few different ways. Coach Jack Del Rio speaks of Complementary Football. 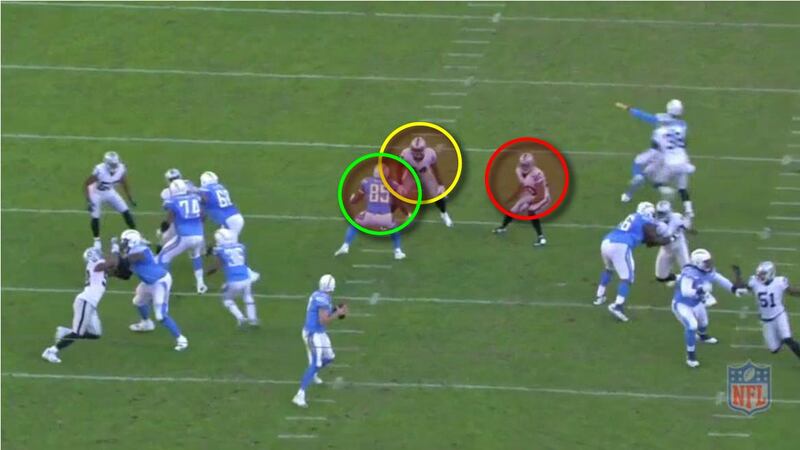 We can also speak of Complementary Pass Rush, where the interior and the outside presence help each other. Flushers and Hunters can switch roles and make for a brutal overall attack. Right now, the personnel is a little lacking and the development of these players (notably Jihad Ward and Darius Latham) is just underway and not in final form. As the injured players rejoin the team and get to full strength and as the young players grow into their full potential, we’ll see more disruptions of the QB. strong work, as always. Appreciated.